90 Degree Quick Connect Coupler with Hydraulic Tip. Quick Connect Coupler QCC-HT9 is Perfect for Lubricating Hard to Reach Areas In Inaccessible Areas. No Threads, No Screwing or Unscrewing, Just Snap the Needle Nose Grease Gun Coupler onto any Standard Coupler and Use. For Hand Operated Grease Guns. 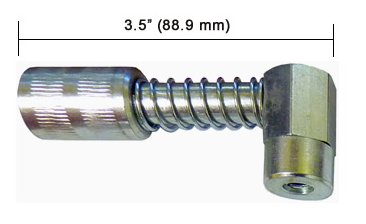 Coupler Length: 3.5" (88.9 mm). Made of Zinc Plated Carbon Steel.